King Sejong Statue. October. 10, 2009 07:50. base@donga.com. 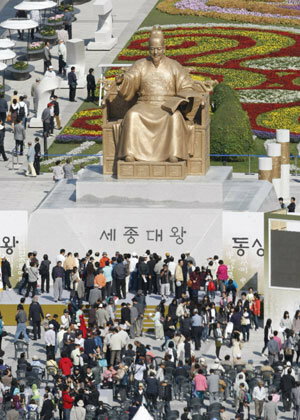 A newly built statue of Joseon Dynasty King Sejong, who invented the Korean alphabet "hangeul," is unveiled at Seoul`s Gwanghwamun Square yesterday to mark the 563rd Hangeul Day. With a height of 6.2 meters and weight of 20 tons, the bronze statue was made by Kim Yeong-won, a carving and modeling professor at Hongik University.